A group of civil society organizations has condemned the official ban on street trading and the military-styled crackdown in very strong terms, describing it as anti-poor, anti-people and capable of further impoverishing the urban poor in light of nationwide excruciating economic conditions. Just days after it announced plans to ban street-trading in Lagos State, the Lagos State Government had since July 1, 2016, begun the full implementation of the new directive with full force. Lagos State’s quasi-security squad, Kick Against Indiscipline (KAI), has reportedly arrested hundreds of traders hawking wares in different parts of Lagos, destroying or seizing their goods in the process. The arrested traders, predominantly from densely-populated areas such as Maryland, Oshodi, Ikeja, Ojota, Ojuelegba, and Obalende, may face a 6-months jail term, or pay N90, 000 fine, or both. ‘We view this ban as a declaration of war against the urban poor already living in necessitous conditions. It poses a grave threat to their struggle for economic survival, and gives a serious blow to their astonishing resilience to overcome poverty,’ Victoria Ohaeri of Spaces for Change, Nigeria, said. “When the reasons advanced by the Lagos State Government and the circumstances surrounding the latest ban are considered together, it becomes clear that the decision was taken in a haste, without any prudent analysis and evaluation of its potential impact on the poor, in particular, the women and the youth, who constitute the majority of street traders,” she added. Ngozi Iwere of Community Life Project described the policy as hasty and ill-thought. More than 65% of Nigerians live below the poverty line without any access to basic goods, services and commodities. Though premised on Section 1 of the Lagos State Street Trading and Illegal Market Prohibition Law 2003 which restricts street trading and hawking in the metropolis, the rising poverty levels in the country makes the ban unconscionable and untimely. Coming at a time when inflation rose to a more than six-year high, hitting 15.6 percent, the ban will “worsen poverty and unemployment, put a lot of stress on low income families, and make children and women more vulnerable to malnutrition and anemia, thereby increasing the burden of child and maternal morbidity and mortality,’ she says. According to the CSO groups, official attempts to win public sympathy by framing the ban as a crime-fighting strategy is both unpersuasive and unimpressive. Recent events show that the ban is likely to yield opposite results. Persisting economic downturn in the country has seen the number of unemployed and underemployed persons surge to 22.45 million in the 4th quarter of 2015. A total ban, without any projection of new or alternative jobs in sight, will force people out of productive activities, and evidently lead to the escalation of criminal activities in the state. High interest rates on loans and administrative fees, including other stringent collateral requirements, which the poor, the unemployed and low-income earners are often unable to satisfy, casts further doubts on their ability to access the so-called N25billion Employment Trust Fund, created by the Lagos State Government. The few who are able to surmount these hurdles hardly recuperate their investment, throwing them deeper into poverty and debt. According to Betty Abah, Executive Director of Centre for Children’s Health Education, Orientation and Protection (CEE-HOPE), the policy is not only crude, it is a direct declaration of war on the urban poor, including vulnerable children. ‘It batters the imagination that the Lagos State Government would choose, of all times, now that people of all shades are barely surviving in the country, with massive job losses. Taking away their only means of livelihoods under any guise and throwing their families, including innocent children, into starvation, especially where government would not provide alternatives, is an unthinkable blow to their sheer survival and a most condemnable act,’ she added. 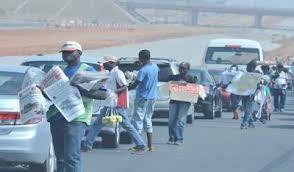 For Emeka J. Ononamadu, Executive Director, Citizens Center for Integrated Development & Social Rights, the Lagos State Government should share in the blame for the increase in the number of hawkers and find solution rather than seek to crush them. ‘It is important to clearly let Lagos government to know that those who embark on street trading are victims of bad governance and may not be qualified for second-level punishment from Lagos state. While it is important to remind them of the need to put alternatives in place, it will be reasonable to know whether the prospective victims were part of the process of designing this law that criminalized their major source of livelihood,’ he said. Contrary to official claims that it is an unregulated environment, independent studies show that street-traders are overly levied. Market development boards, market traders associations, and market leaders, often known as Iyalojas, collect N50 per day from street-traders. They are issued vouchers or receipts, signifying an understanding, from which their trade derives legitimacy. Opportunities exist to understand and improve this existing trade arrangement, in order to bolster the state internal revenue, create employment for millions of Lagosians, and create infrastructure to jumpstart the path of sustainable economic growth in the state. It needs to be emphasized that the activities of street-traders are the live-wire of the formal economy, especially the telecommunications, the media (print newspapers), the entertainment industry and food manufacturing sectors, who depend on them to makes sales and deepen their penetration to a wide range of consumers. Not only that, the Federal Ministry of Budget and National Planning has said that the informal sector contribution to the Gross Domestic Product (GDP) is estimated at 57.9 percent. “All over the world, developing cities are battling with the phenomenon of street trading and, only pockets of solutions have been found so far. To ban street trading completely definitely is not a “solution” which has been applied anywhere else,” Monika Umunna of Heinrich Boll Foundation said. This again, buttresses the why thinking through the ban a second time is necessary. Accordingly, our organizations are not opposed to the Lagos State Government’s efforts to rid the state of crime, but we cannot support an approach of “ban first, plan for alternatives later.” We demand that the Lagos State Government properly plans for the massive number of poor people who will be affected by this latest policy. The group is very much willing to cooperate with the relevant government agencies to develop solutions addressing specific problems of urban development caused by street trading and, at the same time, enabling street traders to continue to contribute meaningfully to the Lagos economy. Immediately reverse the hardship-inducing ban on street-trading. Establish platforms for dialogue between Lagos state governments and relevant trade unions, including the civil society to negotiate less-hurtful solutions to street-trading. Restrain security agencies such as KAI from continuing to arrest, intimidate and prosecute street-traders.